When developing the content of a career pathways program, there are important considerations to keep in mind. Your goal is to offer program curriculum that addresses the skills deficit identified by your employer partners. But, you may not have to start from scratch to accomplish this result. Look at existing program curriculum in similar or related areas and determine what can be modified or adapted to support the new curriculum framework. Develop new content, delivery structures, or formats in partnership with employers, aligning the new curriculum with the desired industry credentials. Below is a process for developing a ladder curriculum, ideally suited for career pathways because of its structure that resembles rungs on a ladder, offering sequential, stackable, non-duplicative content. 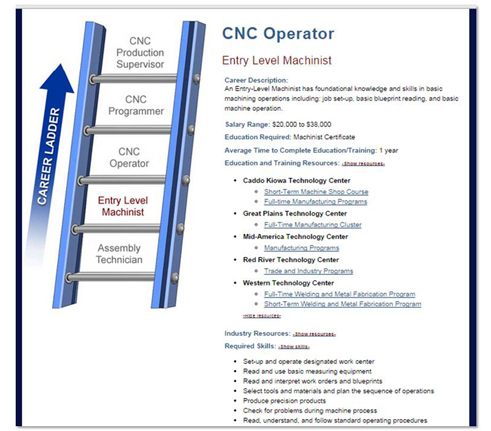 Just as a career ladder denotes a series of job-performance levels, each corresponding to certain knowledge and skills within a given occupational area, a ladder curriculum consists of a series of educational levels that students are expected to attain as they move through their programs. With career pathways programs, the knowledge and skills to be mastered through the ladder curriculum should be determined jointly by educators and employers. Employers are uniquely qualified to identify what employees in their fields should know and be able to do. The ladder curriculum model is flexible enough to meet the needs of a wide range of students, presenting numerous attainable intermediate goals and multiple exit points in the form of “stackable credentials” at each level. There is no standard template for creating a ladder curriculum. Because of its flexibility, the ladder curriculum model can be customized for different settings. In some cases, it might not take the form of a ladder—in which students progress in a strictly linear fashion—but rather a lattice or web, allowing for lateral movement as well. Because of its flexibility, the ladder curriculum is well-suited to support work-based learning experiences such as internships and apprenticeships, allowing for tailoring of the curriculum to meet the specific needs of an employer. In this context, a curriculum framework is a plan for a career pathway. Curriculum frameworks consist of two elements: (1) recommended course sequences and (2) course descriptions, with prerequisites, recommended sequence, credits, and standards to be achieved by students. The career pathways program curriculum committee should be composed of two groups: (1) representatives of local businesses that will employ graduates and (2) community college faculty and staff from partnering educational institutions who will work with the program’s students. The business representatives should be middle managers who understand the jobs the program is preparing students for and who understand their company’s long-term vision and overall trends in their industry. College representatives will likely be department heads and faculty members from the career cluster/pathways being developed. Everyone on the curriculum committee should be open, flexible, and dedicated to working together for the good of the students. This process assumes you are developing a curriculum from scratch, but similar steps would be used to review an existing curriculum and determine gaps that need to be addressed to better serve the chosen career pathway. Selection—The curriculum committee should gather all available skill standards pertaining to the career cluster being addressed. These will consist of three general types: academic, employability, and technical. Standards have been published by numerous entities at multiple levels (national, regional, industry, and academia). Review—The employers on the curriculum committee should review cluster skill standards and tailor them to local needs. If national skill standards do not exist, the employers will have to develop their own, focusing not only on the knowledge, skills, and abilities required for entry-level employment in their industries, but on the requirements for upward mobility along the career ladder in their local areas. Employment levels and the criteria for promotion will naturally vary from company to company. But by committing to the career pathways partnership, employers are agreeing to compromise when determining what will be taught, when, and how it will align to industry credentials. The curriculum committee should identify and agree on the certifications, licenses, and/or degrees that the curriculum would prepare students to achieve. This would also involve correlating each step on the career ladder to the appropriate award or credential. Published standards must usually be tailored to the local specifics of the career pathways program to which they are being applied. This process involves matching, or sequencing, the elements of the standards to the requirements for the various certification, licensure, and degree options that the program offers. This may mean breaking down and resequencing some elements of the standards. The overall result of this process will be a customized list of standards that moves from generalities to details and applies specifically to the program under consideration. The last few stages of the curriculum ladder might include employer-specific standards if you are designing a program to support the workforce needs of a single company. When the list of standards has been compiled, the next step is to select and/or create courses that prepare students to meet those standards. (Of course, the participating educational institutions’ requirements for graduation and the awarding of degrees and certifications must also be considered and woven into the curriculum.) The courses should be sequenced in such a way that, in progressing from each step to the next, students build on previously acquired knowledge and are able to satisfy the career-ladder requirements of the participating employers. The methodology and pedagogy used in teaching these courses should be tailored to the needs of the students, many of whom may thrive in a contextual teaching environment that relates academic concepts to how they’re applied in the technical workplace. The curriculum committee should next determine which courses will address which standards. If existing courses are used, it will usually be necessary to recombine, tailor, or otherwise alter the courses to meet the standards mandated for the program. Each course should have a detailed outline. The outlines should clearly identify how each standard will be addressed in each course. For example, the committee may determine that the communication standards should be addressed in all courses, along with some of the employability standards such as teamwork and dealing with diversity. While the importance of those standards may be obvious to the committee, the topics will not be given sufficient emphasis in the classroom unless the instructor and the students see an explicit requirement in the course outline. The outline should state course requirements in detail rather than generally. The standards drive student assessments, how progress is measured, and the effectiveness of the educational process. Assessment tools and instruments should be developed to determine whether students are progressing appropriately. Assessment tools could include rubrics, checklists, quizzes and tests, portfolios, on-demand demonstrations, and structured observations. Determine when and where courses will be offered and whether special facilities are required. Explore multiple delivery methods and identify the ones that provide the best mix for the audience and locale. More and more colleges are offering multiple delivery modes for technical programs, including online and hybrid course formats. Given career pathways students’ need for flexibility in scheduling – especially those who are working or involved in program-related worksite learning experiences, exploration of alternate delivery methods should be considered essential. The curriculum committee should compile a list of texts, technical manuals, websites, and other resources that support the teaching and learning of the relevant content. Ladder curricula require regular maintenance and fine-tuning. The curriculum committee should meet periodically throughout the curriculum implementation process to ensure that the curriculum is accomplishing its purpose. Changes and adjustments should be made accordingly, bearing in mind that the curriculum is designed to meet the needs of both students and the evolving needs of local employers, as well as satisfying program requirements established by the college.